Smoke Control Areas were established in many large towns and cities in the UK. Local authorities have been given the power to reduce the emissions of smoke and fumes from residential and industrial properties. 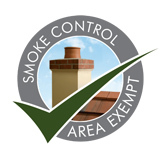 Smoke Control Areas were declared in the 1950s and 1960s to control emissions of smoke, dust and fumes from domestic and industrial properties. As a result, Smoke Control Areas were established in many large towns and cities in the UK. Urban property owners living in Smoke Control Areas have a range of Stovax wood burning or multi-fuel fires to choose from: contemporary or traditionally styled, hearth mounted or inset fires, these fire appliances come in a variety of sizes, styles and colours! If you currently have a non exempt fire in your home, you can install a Smoke Control Kit to enable you to burn logs in your wood burning or multi-fuel appliance. Please consult with your local Stovax retailer for further information and visit the DEFRA website to find out more about burning smokeless fuels in Smoke Control Areas in your non exempt fire appliance.